An Automated External Defibrillator (AED) is a potential life saving machine which in certain circumstances can literary bring the dead back to life. 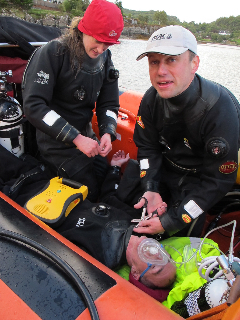 The Club’s Diving Officer, Andy Hunt, perhaps mindful of an increasing number of members aged over 50, decided that this might an interesting but potentially life saving course to organise for the Tyneside 114 membership.  The BSAC fortunately offers a course which follows the guidelines of the Resuscitation Council (UK) in the use of these devices in order to encourage their use within branches. Indeed the BSAC owns a number of Laerdal HeartStart FRx training AED units available for Regional Coaching schemes precisely for this purpose. 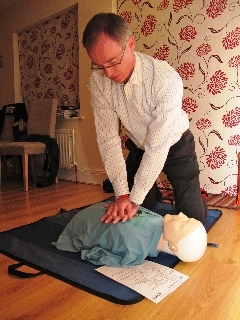 The BSAC AED course however assumes that all participants have a reasonable knowledge of first aid training. It is very much aimed at teaching the use of an AED in a diving situation. 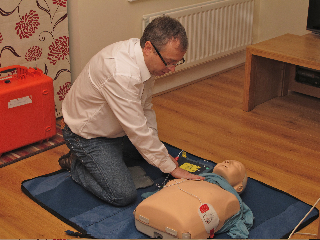 Training AED’s however are only used on all instructional courses rather than ‘live’ machines. The course itself gives a basic introduction to the physiology of how the human heart functions and how abnormal rhythms of heart activity, a Ventricular Fibrillation (VF), can disrupt the blood flow to the muscles of the heart, causing the organ to rapidly fail and die. An AED works on the principle of using an electrical shock to stop the heart and disrupt the abnormal heart rhythm, with the aim of the heart restarting but with a normal rhythm and thus restoring the live saving blood flow. Indeed all AED machines are constructed with simplicity of use at the core of their design. Switch the machine on and a soothing voice will guide you purposefully through the assembling of the pads and their placement on the casualty. The machine will then analyse the electrical activity of the casualty’s heart looking for abnormalities. If the AED detects a VF, then it generates a high voltage shock. Once fully charged the machine will then give the operator instructions to administer the required shock by pressing the button. It is not possible however to deliver a shock if the AED has not detected an abnormal heart rhythm. For every minute the heart is experiencing a VF the chances of survival by the casualty decreases by 10%. Speed with regard to the assembly and use of an AED is therefore key to the survival outcome of a casualty suffering a cardiac arrest. Use of an AED in a typical wet dive environment inevitably brings its own special complications and challenges, not least because complex electrical equipment, high voltages and seawater are not an ideal combination. The use of a waterproof padded case for storage of the AED is therefore recommended. Cases also need to be clearly marked with the appropriate symbol to indicate that they contain a defibrillator. Peli cases are also popular with underwater photographers and it would be a shame to open a case during a real emergency only to find it contained camera equipment rather than an AED! Whilst the BSAC as an organisation cannot recommend any specific make or model of AED, it does recommend that dive clubs considering purchasing an AED look to ensure that it has a minimum IP55 waterproof rating in order to survive the rigours of operating in the marine environment experienced on most dive RIBS. 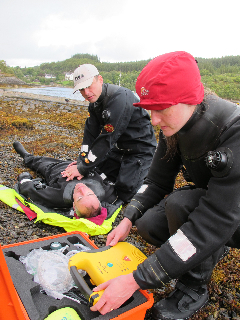 The course also encourages participants to think about supplementing an AED kit with some vital extras, in particular a good pair of strong scissors or shears, capable of cutting through drysuit material in order to quickly exposes the casualty’s chest, bearing in mind how precious time is in terms of positive treatment outcomes. Other suggested items included a razor (for removing excess chest hair) and some form of towel to get rid of excess water, and thereby provide a better contact surface for the pads. The course also provides a good opportunity for participants to refresh and practice basic life support skills, but whilst including the use of an AED. It also highlights some of the other ‘special and unique’ considerations that need to be taken into account whilst dealing with a diver related incident, such as remembering to turn off O2 kits prior to using an AED (high voltages and pure Oxygen are a combustible combination!). It is even recommended that VHF radios are switched off in order to ensure minimum interference whilst the AED monitors and analyses the electrical activity of the casualty’s heart. 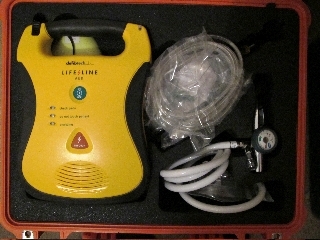 Other topics covered by the course also includes the legal status of a rescuer as well as highlighting the importance of routine maintenance to ensure that AED’s are kept at a state of effective readiness, particularly given the harshness of the marine environment that a typical club owned machine might encounter. Once qualified to use an AED, operators are recommended to undertake an annual ‘refresher’ on the use of AED’s. Such a refresher course however also provides a useful opportunity to further review and update basic life support skills by participants. The course ended with a review of all the other relevant skill development courses offered by the BSAC to promote the safety of its membership, such as First Aid for Divers, 02 Administration, Practical Rescue Management, Advance Lifesaving etc. The importance of life support practice and keeping up to date with current best practice is also strongly emphasised. Finally participants were shown a clip of an AED being used in a real case scenario on Bondi Beach in Australia, which clearly demonstrated how effective the use of a defibrillator, could be at saving life in certain circumstances. Strangely enough this video clip appeared to be particularly popular with the female participants on the AED course! 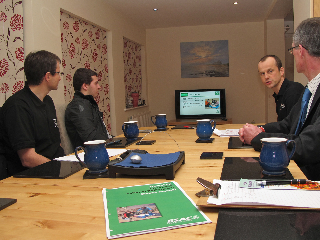 Many thanks to John Kay (from Fell Divers BSAC) and Andy Hunt for delivering this AED training course.